As Jesus was going into Jericho, a noisy crowd followed Him. When a blind beggar called Bartimaeus who was sitting by the roadside heard all the noises that the people were making, he asked the people what was the commotion all about. The people told him that Jesus of Nazareth had came to Jericho. Jesus had compassion on Bartimaeus and asked that he be brought to Him. Bartimaeus quickly throw away his garment to a side and got up and came to Jesus. At that very moment, Bartimaeus’ eyes were healed and he can see again. Bartimaeus was very happy and immediately he followed Jesus. When the people saw that Jesus healed Bartimaeus, they gave thanks to God for it. 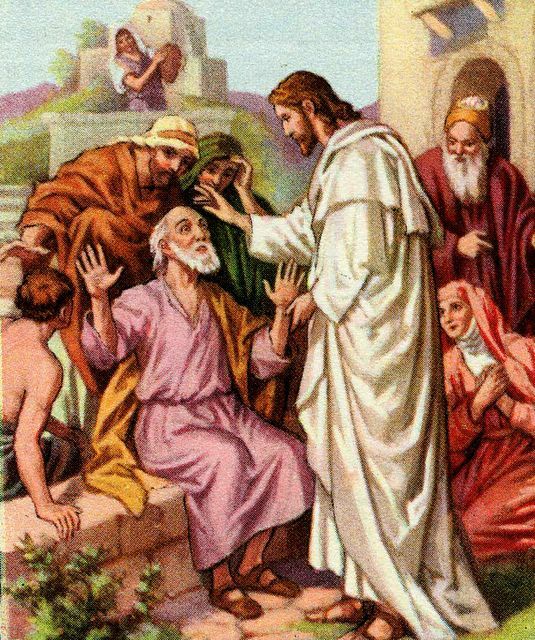 The blind man, Bartimaeus was healed because he believed that Jesus has the power to help him to recover his eye sight and so he asked Jesus to heal him. Bartimaeus acted in faith and therefore his eyes were healed. Jericho was a place that was under the curse of Joshua, but Jesus still performs miracles at that place. I found it an interesting plraalel/repetition that in both cases, Jesus asked, What do you want me to do for you? For the blind man’s case it would have been obvious what he wanted from Jesus, and even in the case of James and John, we know that Jesus knew peoples’ hearts (as evidenced by his responding to what the Pharisees/Teachers of the Law were often thinking) Yet for both cases, he wanted them to ask. For James and John, the answer was somewhere between ambiguous and no. For the blind man, it was a yes. But both times Jesus wanted them to ask. This reminds me how in my own life, Jesus wants me to come to him with my requests. He doesn’t want me to throw up a quick, Jesus help me today, Amen. He wants me to voice my specific prayer He wants to converse with me, regardless of whether or not his answer will be yes or no or we’ll see . He wants to see that I have the faith to ask for it. (It is easy for the faith-less to pray blanket prayers so that if the specific request goes unanswered or is ambivalent it’s easier to shrug it off. How much more do we invest when we specifically come to our Lord with a direct request of him? It means we’ll have to get a specific answer one way or another and as a result requires more faith and boldness on our part.) He wants to build a relationship with me that can only grow by our conversation. This is a good reminder for me right now. Thank you for your story of how the site, through its presentation of this story, helped you think about your relationship with Jesus.